Hurricane Storm Damage :: Law Offices of Geoffrey Gilbert, P.A. The citizens of Florida are well aware that our State is a target of tropical storms and hurricanes—in recent memory, from Hurricane Andrew to Hurricane Irma and all those hurricanes and tropical storms in between. After personal safety and seeking secure shelter, there is no bigger concern than the protection of our homes and businesses. The combination of wind and rain in these severe weather systems causes a great deal of property damage, particularly to roofs, windows and doors of houses, condominiums, and commercial properties. Roofs can be torn off a structure, pushed up or rolled off a building (“like a sardine can” one property damage victim said of Hurricane Wilma). Under the pressure of the wind, shingles are blown off the roof and scattered about the property or remain in place after being loosened and cracked. Windows, doors, and vents are penetrated by wind driven rain or opened up all together. Tiny gaps in a structure are exploited to make porous entries into the building. As the building envelope deteriorates and water intrusion ensues, significant water damage to a dwelling or business can occur. Hurricane and tropical storm force winds also lead to structural damage to buildings by causing flying debris, fallen trees and power lines, and can also destroy fences, carports, porches, and awnings. 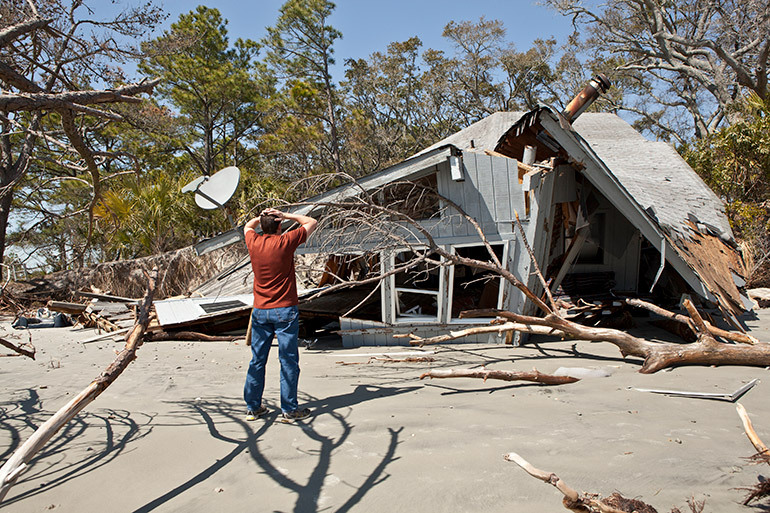 Most insurance policies cover hurricane and storm damage. In return for premiums paid, it is the only guarantee against the fury of these unavoidable events. However, insurance coverage for your house or commercial property may be disputed by your insurer on several fronts: that the damage was pre-existing, that the damage was caused by flood not covered under the policy, neglect of the property, a failure to mitigate, or that the damage was not reported immediately. The insurer may provide only a portion of the coverage you need and fail to acknowledge the severity of the actual damage with its associated costs for repair and restoration. If your residence or business has suffered storm or hurricane damage, it is best to have an attorney representing your interests. The Law Offices of Geoffrey Gilbert, P.A. are Florida insurance attorneys for storm and hurricane related claims. We would be pleased to consult with you about your storm and hurricane insurance matter, and invite you to contact us to set up a case evaluation. Contact your insurance company as soon as possible to notify it of the damage; take notes of what you told the insurance representative. Keep receipts of all purchases from any repairs. Keep everything well documented. When safety permits, take pictures of all visible damage to the interior and exterior that has been sustained in the storm. Stay inside until proper authorities say it is OK to go outside. Stay away from fallen trees and downed power lines. Never go anywhere near downed power lines even if they do not appear to be energized—as the power company may not know and could re-energize the lines or even if they do know could re-energize the line in an act of gross negligence. If you see downed power lines, immediately call the power company. Do not walk into standing water or drive through flooded areas. Contact the Law Offices of Geoffrey Gilbert, P.A. to obtain guidance with your claim from an experienced Florida insurance attorney.